Dr. Ruja Ignatova was born in Bulgaria. She graduated in Konstanz, and took her doctorate degree in economics in Hagen. From 2002 to 2003 Dr. Ignatova worked as a Research Associate at the University of Konstanz. She then studied at the University of Oxford, graduating in 2004 with the title "Master Juris in European and Comparative Law". 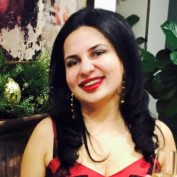 Currently she is founder and owner of OneCoin - one of the hottest and most innovative products in the emerging crypto-currency market.